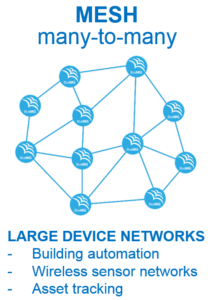 BlueNRG-Mesh is a software solution for connecting multiple BLE (Bluetooth low energy) devices in Mesh networks for Internet of Things (IoT) solutions. It enables true two-way communication between Bluetooth-enabled devices in powerful, secure, integrated and range-extending Mesh networks. This entry was posted in BLE, Mesh, STM32. Bookmark the permalink.